Woke up the next Friday morning and Gabriel and I almost didn’t know what to do with ourselves. It was the first day in 2 weeks where we didn’t have to get up, eat, gather our gear together, and start walking. Instead we enjoyed a final evening in a Victorian Bed & Breakfast, a final full English breakfast, and a final goodbye to “the trail”. After breakfast we packed our gear up, ran into Robin Hood’s Bay to get Gabriel a souvenir Coast to Coast T-Shirt, and then caught the bus to Scarborough where we would transfer to a train that would take us on a 3 hour trip back down to London. We checked into a Travel Lodge hotel in Covent Garden which, I must say, lacked the style and atmosphere of the bed & Breakfasts I had grown accustomed. We had enough time to get showered and changed for our big celebration though. Two months earlier I had asked Gabriel what West End show he would like to see to celebrate the end of our big adventure. He responded, “Jersey Boys!”. So I managed to get two tickets…second row! What an amazing show. A perfect and joyful end to what was darn near close to the perfect trip a father son can have. The next day we toured the British Museum for about 3 hours before we headed out to Heathrow for our flight back to Hong Kong! * People for months asked me what training I was doing for the hike. The answer?? I didn’t do any beyond the occasional workouts and runs I do anyhow. It can be tough in sections for sure but if you are moderately fit and set in your heart you will finish it…you will finish it. * Having said that make sure you do everything to protect your feet. Gabriel and I wore liner socks with a good hiking socks over them. Plus some form of blister relief bandages and creams. I went blister free for 200 miles by taking care and Gabriel was mostly blister free. * Enjoy other people! Probably the most fun he had was the interaction we had with each other and all the wonderful people we met. 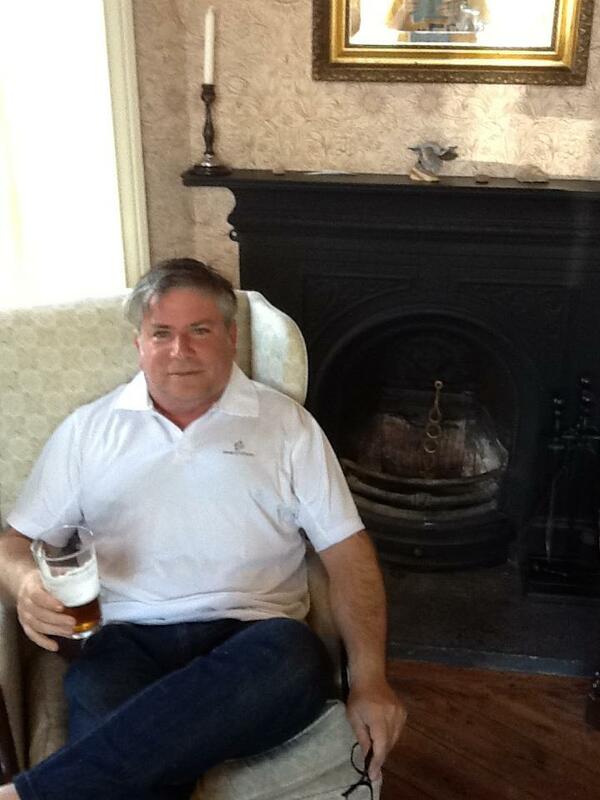 Be proactive…introduce yourself and enjoy a laugh, a meal, and some ale with a new friend. * Navigation: We chose NOT to use GPS as we wanted this to be an adventure and risk getting lost at times. 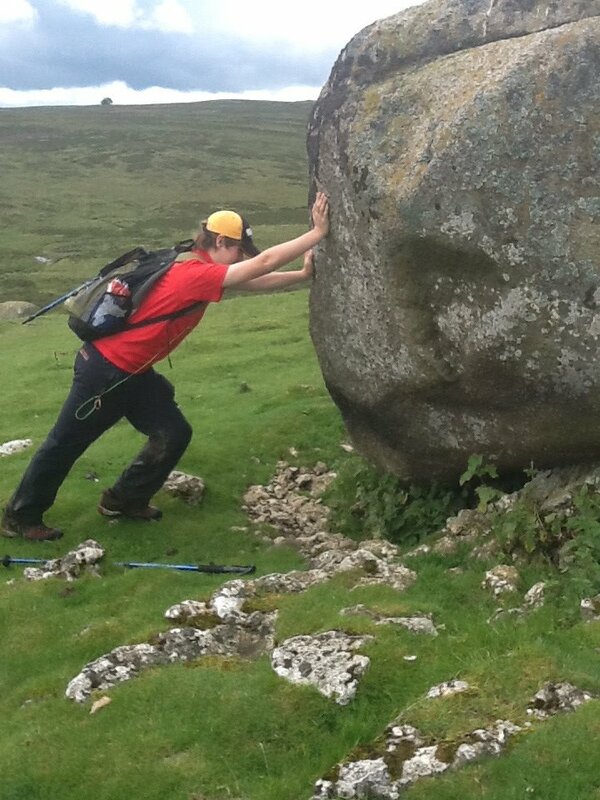 If you go sans GPS don’t think you you won’t need a compass…you will! For all intents and purposes we did the whole walk with the Trailblazer “Stedman” guide which has about 100 hand drawn maps…and a compass. * Enjoy! And if these posts have helped you in any way, leave a comment and let us know! Woke up in Lisvane bed and breakfast which was another gorgeous home. I must admit the owner at first did not win me over. Not that she was rude mind you, just matter of fact in a way that made us feel a little unwelcome when we arrived. Then I found out that I had to pay 2 pounds for the wi-fi password which made me slightly annoyed as we hadn’t had to pay at any other place the last two weeks. As with many situations in life though, there is always another side to the story. In the morning at breakfast our landlady’s demeanor had changed and she was very gracious and talkative (maybe something else on her mind last night?). She explained that she charges for the wi-fi (without my inquiring why) as a donation to the volunteer mountain rescue teams that help stranded hikers. (Any irritation I had with paying 2 pounds instantly disappeared). She mentioned that since the BBC documentary on the Coast to Coast with Julia Bradbury had come out in 2009 there had been a spike in the number of hikers needing the services of rescue teams as people watching Julia jogging along the trail were under the impression it was easy…and its NOT! (Rumor has it that Julia didn’t even do the walk). 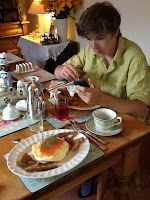 Anyhow we bid farewell but I do have to mention that you know you are in a small town when the barmaid who brought our dinner to us in the pub the night before is the same girl who came in the morning to deliver Gabriel and I our full English breakfast. 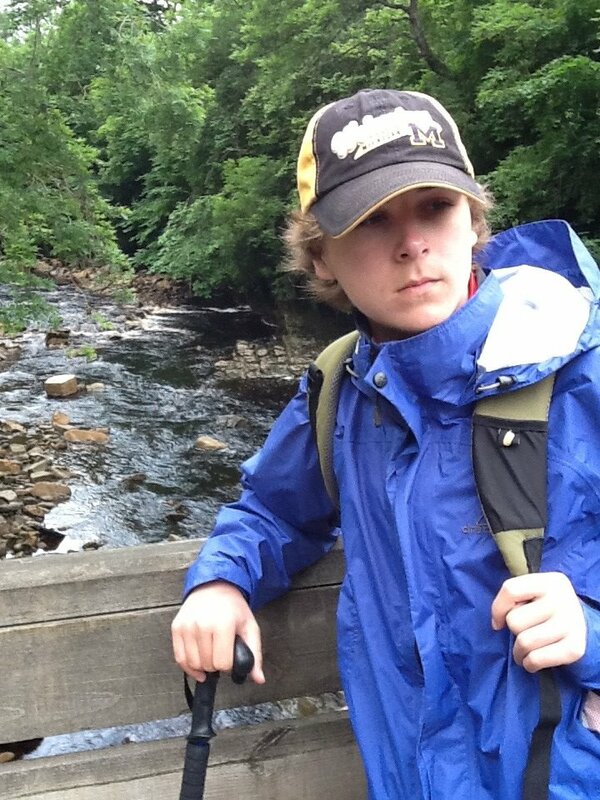 The hike out of Grosmont is a somewhat steep climb and Gabriel’s blister was bothering him so we moved slowly. We had now become accustomed to his foot needing a while to work itself in. As luck would have it though we took the wrong road out of the town (looked pretty confusing on the map I must say). Realizing we were heading in the wrong direction and yet trying to avoid backtracking down to the starting point again I looked around for a local I could ask directions from. 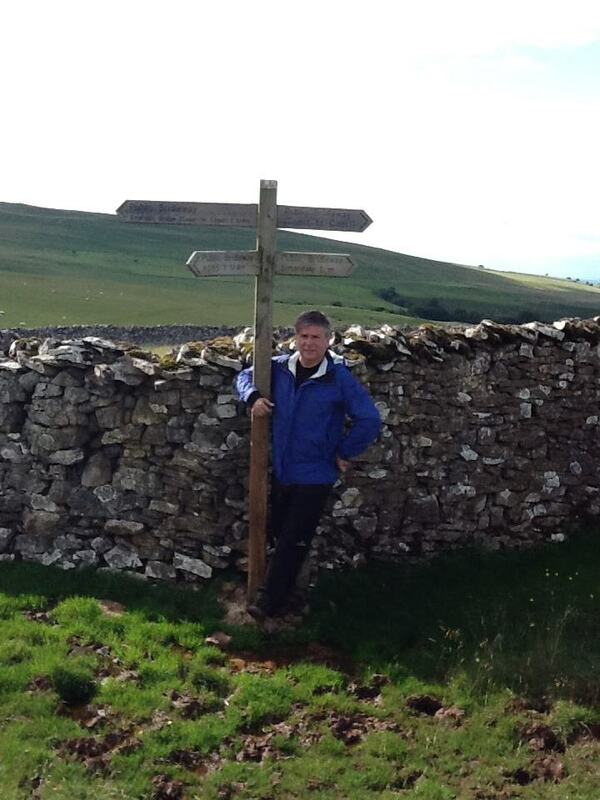 I don’t think I have mentioned how much I have enjoyed doing this walk in an English speaking country. The ability to ask a local person directions without crude attempts at a foreign language, speaking in baby talk English, or resorting to charades and hand signals was a welcome advantage. Finally an older man tending his garden saw me with my map in my hand and said, “you look like a lost Coast to Coaster”. He went on to tell me that the intersection near us would put us back on track with minimum backtracking…a welcome relief. Afterwards we hiked off into the woods and ended up on the wrong side of the river. Gabriel did and “Indiana Jones” by climbing across on a fallen tree while I continued down another 1/8 of a mile until I found a number of rocks that would allow me to get over. (Only got one boot wet). We emerged from the woods for one last march across the moors (I really thought we were done). Anybody who thinks this last day is just and easy end to the C2C has another thought coming. The moor areas were darn near close to swamp and as we got closer to the sea in the distance the ability to stay dry became impossible. We finally gave up and for about 2 miles we alternated between dry grass trail and being up to our calve in water. Oh, well! At one point we missed a marker in the midst of a marshy area and we even knew we could get lost as the map said, “Careful, its easy to get lost in here”. There have been a number of times where a compass came in handy on this trip to get our bearings…and this was one of them. We managed to get on some kind of path but realized it was heading us the wrong way again. I didn’t even need a compass here as I could see the North Sea and knew we were heading towards Whitby and away from Robin Hood’s Bay. I started getting really frustrated but it was Gabriel who kept the peace wanting to know why I was getting so mad when we should just enjoy the situation. I told him I didn’t mind getting wet and muddy walking in the right direction…but in the wrong direction? Fortunately, as what often happened when we got lost…it wasn’t as bad as we first thought (a good life lesson here). The negligible path we were on finally merged with a cement path that had a Robin Hood’s Bay directional sign on it. About 10 minutes later we were back where we were supposed to be and FINALLY reaching the sea! Old Wainwright though, he doesn’t let you finish here, oh no! Like the beginning along the Irish Sea 2 weeks and 200 miles back, he wants you to see the coast for a while before dipping your boot into the water for a finish. And the wait is well worth it. Beautiful cliffs, ocean breezes, and gawking seagulls are part of your last hour or so on the Coast to Coast. Our necks kept straining around every bend to see if we could finally see Robin Hood’s Bay…until around one particular bend…there it was. Just a quaint little fishing village…but it was our destination. We entered into the top of the town and walked past our bed & breakfast for the night. We decided to pop in and let our host know we had arrived before heading down to the bay for our ceremonial finish. Jane, the owner of The Villa, kindly offered to walk down with us to film the big moment. Like many others before us, we were getting ready to end our big adventure. As you walk past tourists and locals alike you want to almost scream out, “You know what we’ve done? We’ve just walked 2 weeks and across a country to be here today! !” Gabriel and I reached the water whose tide, which unlike St. Bees 2 weeks earlier, was in. We we let the water wash up on our boots, Gabriel threw his rock (I kept mine and turns out he had 2 and kept one as well) and we hugged. Mission accomplished! A dream 16 years in the making was realized. The boys enjoying the finish! Our fellow walkers from Germany were also on hand having finished about 30 minutes before us. 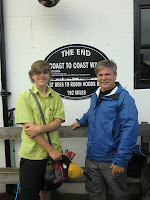 We agreed to meet back at Wainwrights bar for a celebration dinner and a toast to having accomplished the Coast to Coast walk! Ah, The Lion Inn!! What could make for better atmosphere than spending a night in a 500 year old inn, isolated, located high up on the English moors on a foggy windy night? I even woke up in the night because the window I had left open was now banging in the wind. I looked out into the foggy distance as I closed it and thought this is exactly the moment where the werewolves would attack in the movies…but not tonight. We woke for breakfast which as usual was quite good. I even tried “kippers” for the first time which I mostly enjoyed. We packed up and said good bye to our Aussie friends as they would only be going as far as Glaisdale today…and waved to the Germans who we know we would see in Grosmont later. When we left the fog had mostly lifted but the wind was harsh. The first hour of the day involves walking in a horseshoe pattern along the top of a moor. Ironically this meant after 45 minutes of walking we were closer to The Lion Inn than we were after 20. It was hard to talk and Gabriel’s blister was hurting so we walked slowly in silence as the wind howled. We did come to “Fat Betty” which is a large stone cross on the side of the road where tradition has it you are supposed to take a snack…and leave a snack. Unfortunately due to the heavy rain there was a moat of water and mud around old’ Betty. There was a Snickers bar sitting up there but Gabriel and I chose to just get a picture and move on. Gabriel and I kept commenting that “tomorrow is our last day”. I think it is a bittersweet feeling. We’re looking forward to finishing and getting home to Tammy and Ethan George, but we’ll miss the adventure and challenges of the trail. 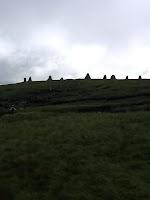 We finally descended off the moors in to the green valleys again coming to the village of Glaisdale. Because we had spent a bit more money than usual at the Lion Inn we wanted to scale it down for lunch today. We thought to just get a couple of sandwiches from the village shop but that was closed for lunch. (ah, small towns). But the village butcher was open next door and we got perhaps the best deal we’ve had since we started our adventure. Fresh meat pies stock full of beef and chicken for only £1.10 a piece. We each had one and split a third. Coming up to the town of Egton Bridge we stopped by the St. Hedda’s church which is a beautiful catholic church and surprisingly is quite grand and ornate for such a small village. Certainly worth a look if you get the chance… The guidebook said that in 1679 Nicholas Postgate, the priest at the time, was hung, drawn and quartered for continuing to practice his faith. How can someone be sentenced to such a torturous death simply because they worship God in a slightly different way? Madness!!! We finally arrived in the afternoon at the Lisvane Bed & Breakfast which is another beautiful home in a very picturesque town. We had a bit of a rest before heading down to the North Yorkshire Railway Station to look at all the train locomotives. What is it with trains and guys? The locomotives here were used in the first Harry Potter movie as The Hogwarts Express. After a walk around the train yard we headed over to the appropriately named pub called The Station for dinner where we were joined by our German friends who were already there playing darts. We shared a meal together before saying good night and agreeing to meet tomorrow evening in Wainwright’s bar for a celebratory beer after finishing the walk. 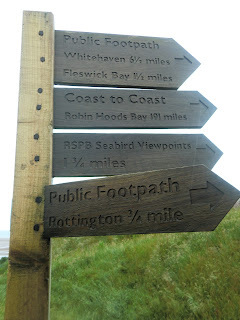 We headed back up the road and prepared for The End…Robin Hood’s Bay…15.5 Miles away! Woke up this morning feeling good. Today was only going to be a 9 mile walk. This in itself is testimony to how we have changed. If I told Gabriel back in Hong Kong on a Saturday morning we were off on a 9 mile hike he would have given me all kinds of grief. Now 9 miles was going to be an easy day! Had a great meal the night before with a couple pints of good ale. Wolfgang may be “Australian” but his knowledge and appreciation of good beer was definitely “German”. Wolfgang’s wife drove us along with “The Shepherds” (John & Cathy) back to Clay Bank Top. We started out together but as Gabriel’s blister started acting up we said our goodbyes to “The Shepherds” who were heading farther today so as they would be able to finish the walk the next day. John sent be his audio blog of an encounter he had that we would have experienced if we had joined them in the longer day. Apparently up on the moor a hiker approached them from the opposite direction. At first he though the man was wearing pink which is a little strange while out hiking on the moors. However as the man got closer he realized other that hiking boots and a rucksack, the man was stark naked. Apparently they passed each other with John saying “Good afternoon” and the man replying the same back. He waited until the man was about 50 yards away and although he admits he doesn’t usually take pictures of naked men, he needed this for proof to which I wholeheartedly agree. You can get his audio account here! I hope he doesn’t mind me reusing his pic but I can’t resist. 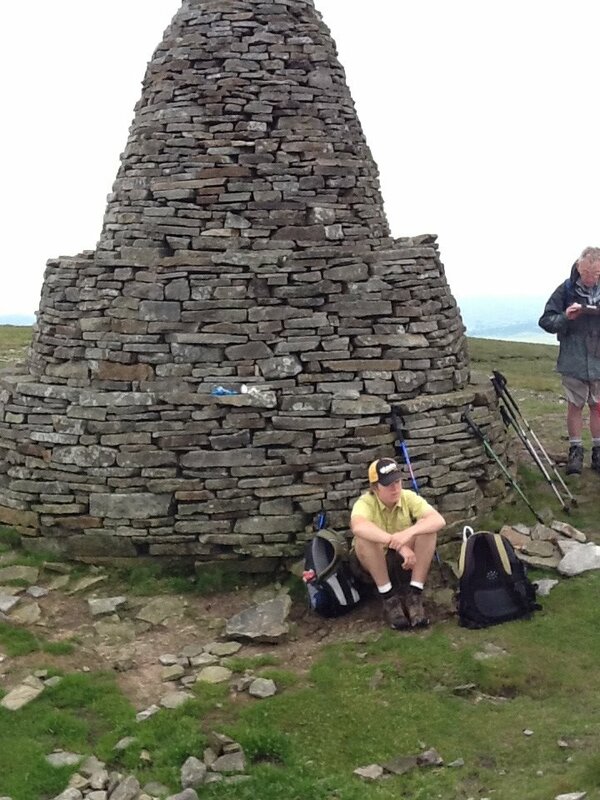 We reached the Lion Inn about 12:20 in the afternoon. Usually this would be a problem at a bed and breakfast as they would be no where near ready to receive you at that hour but being an inn, and a 500 year old inn at that, they handed us our room keys and we were inn. When we rolled into Park House last night we could hardly walk. Everything hurt. I long distance walking friend of mine had told me before this trip that when he keeps a daily walk over long distances at 18 – 20 miles, blisters and body do well. It’s after that 20 mile number that the body starts to really feel it. I can say that is pretty true. I was in good shape up to about 20 miles…then I started to get tired. Going upstairs to my room at the Park House I had to grab on to the rail as I was SO sore. Also, I had misread the guide that had said the Park House provided food. Gabriel had wanted to eat in Ingleby Cross but as it was already after 8:00 PM I assumed that Beverly, our landlady, would be wondering where we were. Sure enough, she had hopped on her 4 wheeler and had come looking for us just as we approached. Apparently, they provide a dinner with 24 hours notice but seeing our condition she took pity on us and in no time we had homemade bread sandwiches and steaming bowls of soup in front of us. The next day we prepared for our much shorter journey of 12 miles to Clay Bank Top. After a pleasant journey (all uphill mind you) through a beautiful stretch of woods, you suddenly break out into the open fields and begin the first day of traveling across the moors of England. Although it was a shorter day there was a lot of elevation change…which essentially meant you went up atop one moor, walked across, and came down the other side only to then repeat the process again. There were some beautiful views up there though despite the wind. Now, when I really needed him, he seemed to ignore my calls and continue to prance down the hillside. We met up with our new Aussie friends who I forgot to mention had spent the evening at Park House the night before with us. The nephew, Rob, was making a tuna fajita in the field for lunch. We chatted a bit and then made our way. We would connect with them the following evening when we reached The Lion Inn. When we reached Clay Bank Top there is actually nothing there except a parking lot. The Buck Inn where we were staying was almost 3 miles away and we were expected to call them when we arrived and they would come fetch us and then deliver us back to the same point in the morning to continue. Gabriel and I were a little disappointed as we had gone 11 days now using no other transportation other than our own feet. We were kind of hoping we’d go the whole time without riding in a car but the choice was an extra 3 miles there and back…so we opted for the car. Thankfully as we didn’t have a phone some fellow walkers lent us their cell and about 10 minutes later we were picked up by the proprietor of The Buck Inn, Wolfgang. Wolfgang had a strong German accent but said he was from Australia. Almost automatically he explained he had been born in Germany but lived in Oz for 28 years becoming and Australian citizen. I appreciated that as through the whole trip people asked where we were from, or the more perceptive asked, “So what part of the States are you from?” Of course when we said we were from Hong Kong we got that quizzical look So we started introducing ourselves as “Americans from Hong Kong”…and then the explanation. Ah, The Shepherds. I hadn’t recognized him without his hat. We chatted for a bit and I learned he was a business professional who had never dealt with sheep in his life…he just did what needed to be done. Good guy…as were just about everyone on this walk tended to be. 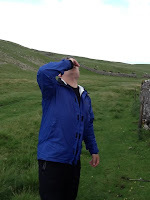 Gabriel and I had dinner a little later and then got to sleep early excited that tomorrow’s walk to Blakey Ridge would be the shortest walk of the whole trip, which after the last two day’s walk we were sure looking forward to. It’s days like today you both dread…and thank God for. I knew being this would be our longest mileage stage that we would need to get and early start. We had an 7:30 AM breakfast at the West End. Ian ( we’ve been meeting a lot of Ian’s on this trip) sorted us out in style with a helping of salmon and scrambled egg on toast that rivaled anything else we have had on the trip taste wise. There was even Chinese from Macau staying at the B & B that night who we chatted with for a moment before we departed. I was so happy to set off a 8 AM but then things took a turn for the worse. We got lost taking the “short cut” through Richmond that Ian had suggested. I’m sure it was easy…just not for us. 20 minutes later we were right back at the entrance to The West End which, of course, put me in a great mood. As we started out again Gabriel started, “ouching” and limping, pulling over to a bench on the side. Removing his boot revealed a nasty blister developing above his ankle. Pulling out our medic bag we affixed a blister bandage and then a little gauze and tape above that. Putting his boot back on he continued to wince in pain as he tried to shimmey down the street. He pulled over onto another bench to sit down while I looked at my watch. 40 minutes out we had accomplished about 200 meters. Not a good start when you have 24 miles to go through grain fields and cow pastures. For the first time I was wondering if Gabriel was going to be able to do the whole walk. Our luggage still hadn’t been picked up at the bed & breakfast and Packhorse allows walkers to ride with them to the next destination if they feel they need a break or are hurting to much. I thought for a moment that Gabriel could ride with Packhorse and I could walk the stage meeting him in the evening and giving him a good day’s rest. But my goal, dream really, was that Gabriel and I would dip our boots together in The North Sea at Robin Hood’s Bay having done the WHOLE Coast to Coast walk. He wrapped his foot and we made our way through Richmond. Our travel maps are hand drawn in the “Stedman” guide and allows the walk to be done in map “sections”. Most days we needed to get through 6 – 8 maps…today we had to get through 11. With Gabriel moving faster now we completed the first map about an hour later. “How are you doing? I asked. We were fortunate that the elevation changes were negligible on this stage. Mostly flat pastures and grain fields…and lots of mud. A couple times we stopped to re wrap the tape and admire Gabriel’s mud caked bare foot. I must admit I didn’t know if he could do it. I mean to walk a mile or two…or even 5….but 24 MILES! I started though to get that Band of Brothers “leave no man behind” thing going. When I was unsure of direction I would run off first and scout the correct way so that he didn’t have extra walking to do. It became my mission to get him to the Park House Bed & Breakfast even if we didn’t make it until midnight. About 4:00 PM we came into Danby Wiske where the White Swan pub was. We were both getting tired so I said we could grab a very quick drink but then needed to get walking again. I went inside while Gabriel tended to his bandages. When I came out Gabriel said he wanted to try putting his boot on. I was excited as I had been nervous that at some point he would hurt his barefoot making the situation even worse. As he drank his coke, we began to clean his foot off with wet wipes and give him some fresh padding for the blister. Boot came on…we walked…I waited for the wince of pain! 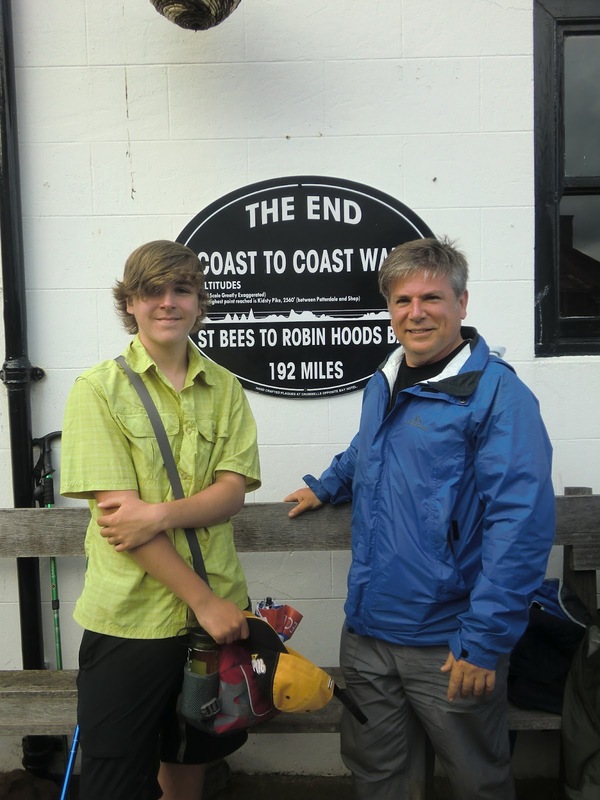 It was at the pub that we met two German Coast to Coasters doing a father – son adventure as well. We chatted for a few minutes but as we were moving slower with Gabriel’s foot, they said goodbye and moved ahead. Then the father double backed and offered some painkillers and ibuprofen that might help Gabriel. That’s what I have really enjoyed out here on the trail…the camaraderie of people all doing this goal together and helping one another. 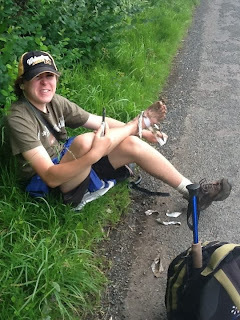 But we figured out that Gabriel had walked more than 13 miles with one barefoot wrapped only in some adhesive tape! Gabriel limped at the beginning but eventually the foot worked itself out…we were on our way. About 8:00 PM we arrived at Ingleby Cross and at this point I was wishing we were staying here and not at the B &B a mile further on. 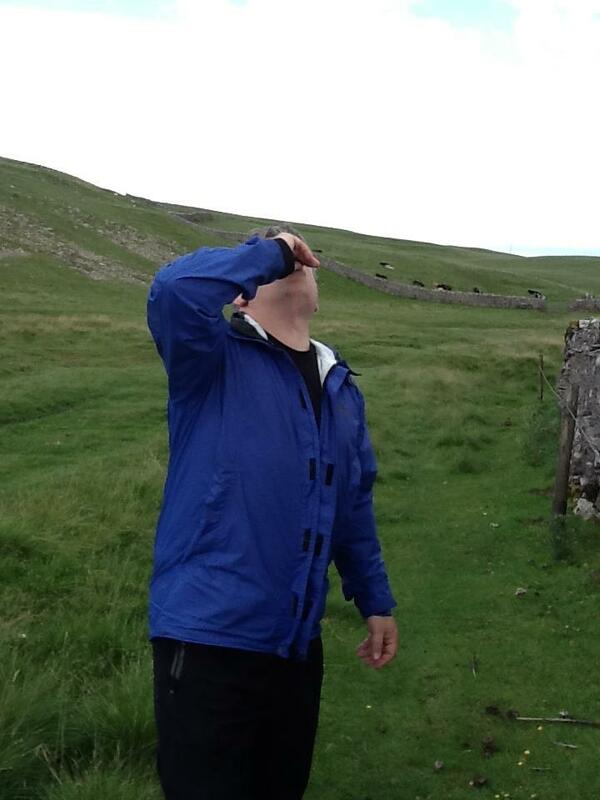 We bypassed the pub even though we were very hungry as my guide said the place we were staying at provided food. Besides it was getting late and I knew the hosts would start to worry soon. Sure enough as we approached, and all terrain vehicle approached and our landlady, Beverly, had just headed out to see if we were OK.
We walked the last 1/2 mile (all up hill) to the Park House. WE HAD MADE IT! I can’t think of a time I was more proud of my son. With this behind us I knew we could make it the next four days to Robin Hood’s Bay! I’m a couple days behind in these blogs so it’s hard to write about this somewhat boring walk day when we’ve just completed a 24 mile marathon…but we’ll give it a brave attempt. Horses were the highlight today! Peter and Jan did possibly the best breakfast presentation I’d seen yet. When we commented on how good it was Peter admitted that he had been in sales before and had learned that presentation can make up for a lack of content. We all agreed that this morning’s breakfast had both presentation…and content! By “we” I mean to suggest the wonderful couple we had breakfast with. Steve and Mary were Coast to Coasters and were doing the trip to celebrate his retiring from being the theater operator in surgery rooms. As he was retired and had spent a long time in the field he shared with us some of the technological breakthroughs he has seen in surgery during his career. I am loving this walk partly because I love people…their lives, and the stories of their lives. Steve’s stories were fascinating to me, especially over such a wonderful breakfast. The walk itself today was a bit short and boring. We would be heading to Richmond which is the largest city on the Coast to Coast walk. I must admit we took a slight deviation from the path. Because we wanted to maximize our time in Richmond we took “the road” rather than the path. Same distance but road travel is a bit faster if, admittedly, slightly more boring – faster than slogging through people’s farms and squeezing through stiles. So after saying good bye to our new friends Steve & Mary as well as to our hosts, Peter and Jan (telling her how my mom said she had honored us by her lovely “scratch” cake) we set off for Richmond. Traveling the road meant dodging cars for 11 miles on a winding country road. I wish I had more to tell on this stretch…but I don’t. It was a pleasure to walk but probably the least interesting on the Coast to Coast. The highlight was running into a couple Coast to Coasters coming along side of us heading back to the path we were avoiding. They mentioned we had to pop into St. Andrew’s Church as it is the nicest church in Yorkshire. Intrigued Gabriel and I made a slight detour to St. Andrews. We paused to look at some of the gravestones. I am fascinated by gravestones. memorials to people who lived and dedications by those who loved them. One grave stone stated that the father had died in 1732 and his son was buried with him in 1782. What did they do? What were their hopes? Their dreams? I want to meet these guys…and who knows, it’s possible. The church itself was amazing. More than just a relic, it obviously was used frequently having a children’s area set aside and slightly upsetting the “solemnity” of the building. No one else was there so we spent a few minutes walking around, saying a moment of prayer, and signing the visitor log indicating we were from Hong Kong. Gabriel even wrote “very beautiful” in Chinese characters. Arriving in Richmond we stumbled upon our B & B almost by accident. We knew, being it was 1:30 that we were way early but we were hoping to at least drop our bags off. “No problem” said Ian, owner of the West End Bed & Breakfast. He took our bags and a few minutes later we were off to paint the town red. Well…not really. We grabbed some lunch and then I bought Gabriel the next two books in the Hitchhiker’s Guide < series at a second hand bookstore we found. We checked out the castle but being Hackman’s what we really wanted to do being back in a big(er) city was see a movie. We had been told that the old train station had been converted into a cinema and art gallery. So yes, in the middle of our big adventure we stopped to see Spiderman in 3D. We were going to need a little break for what was in store for us tomorrow. The meals at the Keld Lodge were quite good. I have to note because of the at atmosphere I was expecting the typical “pub” grub choices. The restaurant there is a step up though. I had chicken breast with a garlic sauce wrapped in Parma ham with vegetables. It was so nice to get a big plate of beans, cauliflower, and carrots rather than a side of chips. My arteries were very thankful. The lodge itself was a converted youth hostel dating back to the Methodist settlement that Keld actually is. In fact Nick, the proprietor, mentioned that the village was “dry” until the 1970’s. I then celebrated the end of that dark time in history by ordering a pint of Black Sheep Bitter. I also have to give a shout out to Nick as he was fantastic. As soon as we had arrived he sorted out our wet boots, got them in the drying room for us, and made sure we got settled right proper. Another place you’ll want to stay when traveling on the Coast to Coast! 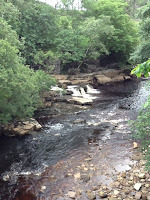 We set off in the morning after breakfast by walking through Keld itself. As small as the village was it had not one but TWO Methodist chapels. Apparently even when there are only 40 or 50 people in a village, the opportunity to “church hop” is made available. We were now out of Cumbria and into Yorkshire. We had the option at this point of taking the “high” route or the “low” route along the river valley. 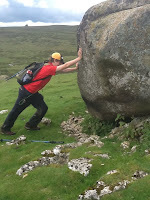 As we’ve had no lack of elevation throughout the last week, we decided that the “low” route was the one we would take. 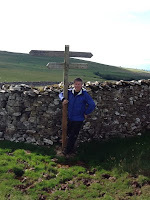 Seems like that was the route of choice as we met many of our fellow hikers coming out of Keld. There are “the dog ladies” not because of their appearance, mind you, but the fact that they are doing the walk with their two dogs. We seemed to be dogging (no pun intended) their steps since The Nine Standards the previous day. We had a leisurely walk through the valley and it’s good thing too as Gabriel has started to have back troubles. In straight- a- ways I have been carrying his pack as well to give him a break. Now my back is starting to act up. Ibuprofen time!!! We stopped at a pub in Gunnyside and it seemed everyone else had as well. Many familiar faces from the last couple days were already there enjoying a break from the wind as well as some refreshments. After about 45 minutes we departed (you can tell it was a shorter walk day as we would never have stopped so long on a longer milage day) and headed down the road to Reeth. Greeted with cake in Reeth! We missed the turn off onto the Coast to Coast path and were 1/4 mile down the road before we realized our mistake. 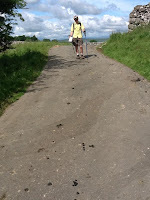 Rather than double back to the trail, we decided to walk the last 6 miles on the road instead taking us right into Reeth. In fact the road took us right past our Bed & Breakfast for the night which was a beautiful home called The Old Schoolhouse. 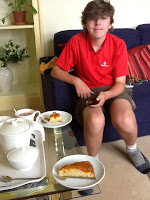 We arrived a little early (seems we are always a little late or a little early) at 3: 30 so Peter, the husband, set us in the lounge with a pot of tea and homemade cake while he and his wife finished doing up the rooms. Later, we had suggested that we were a little tired and may just go buy some food in town to bring back and eat in our room. I could see the look on Peter wasn’t receptive to that and he seemed embarrassed to say he’d rather we eat in the restaurant as they had had some “disasters” with people eating up in their rooms. Fair enough….so Gabriel and I hoofed it to The Buck House where we had dinner in another public house. Tomorrow it’s off to Richmond and the largest town we encounter on the Coast to Coast. Can the courtesy of our B & B hosts get any better? You certainly want to stay at the White Gill if you are on the Coast to Coast. Barbara is the perfect host and greatly reminded me of the “southern hospitality” I experience when I visit my wife’s family in Louisiana. The house itself had a homey feel and you almost felt like you were staying in a son or daughter’s room rather than a B & B. At breakfast we got to meet Simon, who stopped by to say hello. I forgot to mention we are using Packhorse for all of our accommodation arrangements, as well as for moving our luggage to the next location everyday. They have been fabulous and I couldn’t recommend them enough for all the service they have given. Since they are based in Kirkby Stephen he stopped by to introduce himself and see how we were doing. He also gave me £7 that he said we had overpaid because of exchange rate or something. Money going INTO my wallet on this trip…now that was a nice change. I should say now that England is EXPENSIVE. The blow for us is cushioned a bit because Hong Kong is expensive but any Americans be warned, you’ll pay the same for an item in pounds in England as you would dollars in America; except pounds cost roughly 40% more. So if my lasagna dinner in a pub is £10 , the same dinner in the States is $10. Yeah, it hurts a little but I guess it helps pay for the National Health Service. Well, we said our goodbyes and set off. We passed the Motorway on an access bridge and two sheep had gotten out of the stile on the other side. We didn’t know what to do as we didn’t want to leave them. Then along came another couple doing the Coast to Coast. He obviously knew what to do and had Gabriel positioned at the gate as he grabbed the sheep by the scruff and herded them through the stile Gabriel was manning. They instantly became ‘The Shepherds’. About 2 1/2 hours in we finally reached the top of the mountain line where the 9 Standards are. 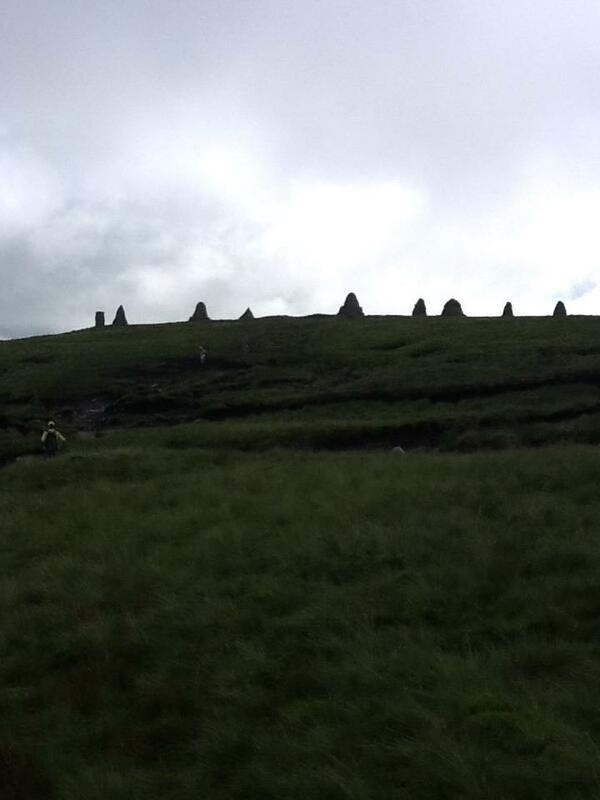 The 9 Standards are just a series of man made rock cairns all in a line at the top. Pretty cool, but no Mt. Rushmore. We grabbed a bite of food and a rest and ventured on. “NO,” I screamed in my mind….but alas, they started to settle in so Gabriel and I ran ahead and found another spot about 5 minutes later. This was something we laughed about. We went through many more stiles and pastures finally arriving at the Keld Lodge just before 4 o’clock. 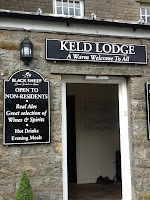 The Keld Lodge is a hotel and pub and I found I enjoyed it when I only had to walk downstairs for dinner. We walk enough on this trip. 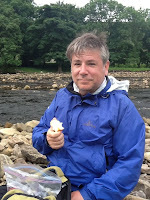 Well, tomorrow we are off to Reeth and another shorter day! Gabriel was none too happy to hear that after the difficult day yesterday we needed to go 21 miles today. Thankfully, because we were out of the Lake District, things were a little easier. First of all, all the rumors about Margaret at The Brookfield are true. She is gracious and thoughtful going the extra mile to make our stay special. Tea and cake were served to us in the drawing room, and the packed lunches she sent us with were so large we still haven’t eaten it all. She also did a load of laundry for us at no charge! At breakfast, we were sad to say goodbye to The Navigators who became Chris & Elaine to us. Wonderful couple who had been with us since St. Bees but would only be going to Orton today putting them one day behind us the rest of the trip. Not only did we enjoy their company but Chris looked a little like C.S Lewis so I liked him immediately. Although the mileage today was long – it was a much gentler walk. The difficulty we find was the “boggy ness” of many sections. I must say that nearly every local we have encountered, from passerby to publican to landlady, has said this has been the worst summer in decades and the worst year to do the Coast to Coast. Although we have actually been spared a lot of rain and have enjoyed mostly good weather the ground is saturated. Navigating water on the trail and trying to lessen the mud impact is constant. I know we are moving slower than other times people posted on their journals and am realizing that many of these areas we are walking through are usually dry…but not this year. Kirby Stephen is a large town and the guidebook said that it had a Chinese takeaway place. Gabriel was motivated the whole day knowing that after 10 days of pub grub he would get some Chinese food. 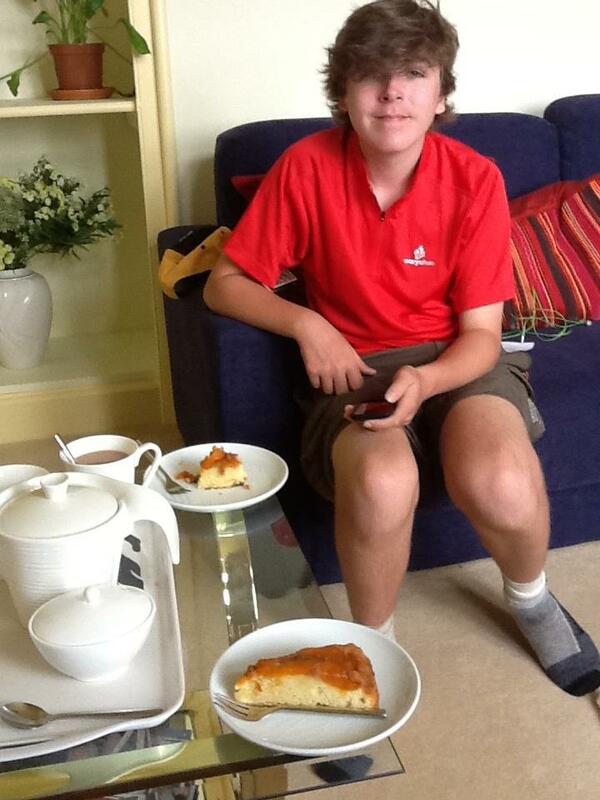 You can take the boy out of Hong Kong but you can’t take Hong Kong out of the boy. About 4 o’clock we took our chocolate energy shots that act as a real “pick me up” on the long days. My wife got them for me before the trip; I don’t know what’s in them…and I don’t ask…but they work. 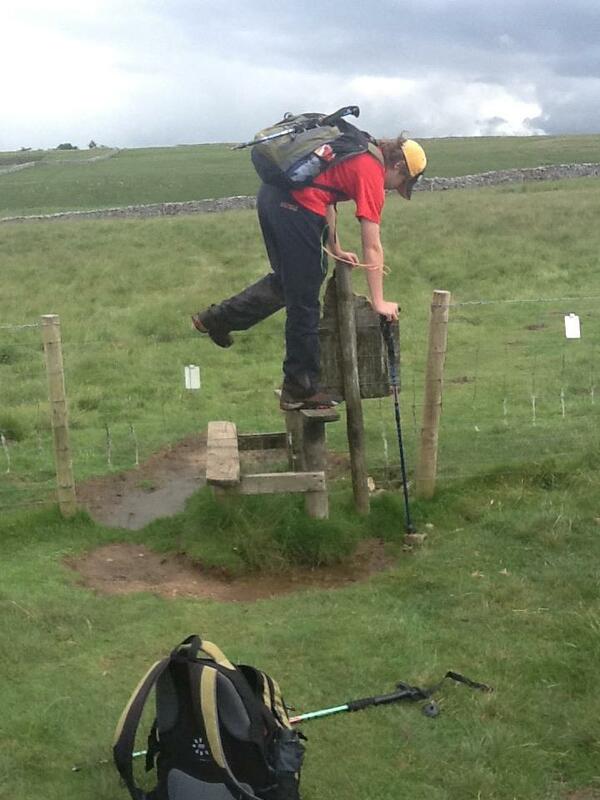 That playlist got us through the frustration of the last boggy section entering Kirkby Stephen. With wet and very tired feet we made it to the White Gill House where another lovely hostess, Barbara, helped us get our muddy gear off and into the drying room. Gabriel and I did have the Chinese takeaway. The owner was from Hong Kong and was very happy to hear we were from Hong Kong as well. I think she really enjoyed chatting to some others from the territory…even if they were gweilos. I wish we could say we really enjoyed the food but my “Kung Pao ji ding” didn’t taste all that great. Gabriel had a similar opinion of his sweet and sour pork. I wonder if she eats her own food? 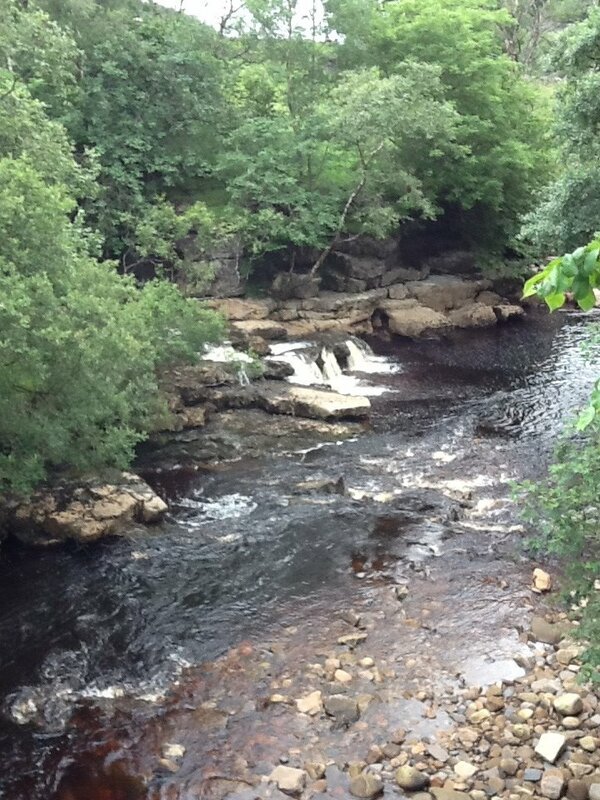 Tomorrow should be a little easier at 12 miles to Keld….but we’ll see. Terry on Prep Day: We’re off!